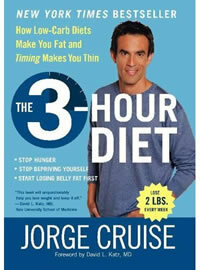 3 Hour Diet is written by Jorge Cruise, who famous for his “8 minutes” series. A renowned fitness trainer, Cruise has capitalized on the popularity of short workout routines. The 3-Hour diet is a logical extension to his fitness routines, bringing in a diet regime to suit the average consumer. Note: Sometimes the author has been erroneously called George Cruise. The 3 Hour diet is all about meal frequency. By eating every 3 hours, blood sugar levels will be more consistent and the bodies metabolism will remain in a heightened state. For most people this will equate to about 5 meals per day – breakfast, lunch, and dinner – with two snacks in between. The 3-Hour diet addresses processed and fast foods – and much of the sales pitch of the book is about being able to lose weight and still eat some “junk” foods. Food groups should always be combined – i.e. protein should be eaten with carbohydrates and fat (and fruit and vegetables where possible). Cruise recommends drinking 8 glasses of water per day. For breakfast, a ham and cheese omelet, bread and lots of fruit. Three hours later, a Pria bar. Three hours later, a lunch of beef enchilada, rice and a salad with regular dressing. Three hours later, a snack like fruit or a few cookies. Three hours later, dinner; salmon, rice, veggies, and three hours later, dessert, like chocolate mousse. The principles of correct nutrition, appropriate exercise, and frequent eating are an effective strategy for losing weight. However the 3-Hour diet tries to be too popular at times. The book describes a method to pick appropriate portion sizes – rather then rigidly counting calories – but later goes on to restrict portion sizes to certain calories! The by-line of the book also criticizes low-carb diets claiming that they do not work. This is a cheap shot as low-carb diets do work for some people (particularly those who are carbohydrate sensitive). The 3-Hour Diet will be useful to many who are just beginning the journey of understanding nutrition and weight management – but it is only a beginning. Many feel that the inclusion of so many processed foods is a sell-out – as healthy nutrition often includes only the most un-processed foods. Weight loss and nutrition are two separate but related issues. Fast food should always be a last-resort food – not a daily staple. However for many people a diet like this is far more approachable than one that suddenly restricts food or calls for dramatic changes. The 3 Day Diet retails for 24.95. 3 Hours to a Better Body? The author makes some outrageous claims – such as “burn 2 pounds of fat per week, with belly fat first”. Such a comment is completely false, as it is not possible to spot reduce body fat – it will burn off from all over the body, and is different for each person. Also, as is most weight loss diets, the body will eventually plateau – and many diets such as the 3-Hour diet seem to conveniently ignore this pattern. The Three Hour Diet will be popular, but in the end offers very little in new science or nutrition. The 3 Hour Diet – How Low Carb Diets Make you Fat and Timing Makes You Thin by Jorge Cruise. wow all you guys should get your facts straight about mcds… and regular mcmuffin minus the cheese only has 6 grams of fat and 300 calories, how is that so bad. and 12 mms really is not going to hurt u its just there so you dont get bored with your food. also sodium content should be a problem unless you dont drink enough water….. I just started this diet last Monday and my starting weight was 288.8.Today when I weighed myself I weigh 284.8.I bought the book and it is a really good book. Thanx MR. CRUISE. should i try this?no!no i should not!i dont think that it will work on me.i cant eat every three hours.it’s even difficult 4 me 2 eat 3 meals.i think i’ll gain weight cuz whenever i eat more then 3 meals or even sometimes 3 meals so i feel so full n my stomach comes out!i really need help!can any1 plz tell me that y does this happens 2 me? It always amazes me – the TOTAL ignorance of those who around us who haven’t got a clue !!! They see the words “McDonald’s” and “M&M” and automatically think this life change is a joke. All diets have some “freebies” and rewards. If you’d take the time to read the book and try the plan, you would find that it really does work. However, these “bashers” probably haven’t got any type of life and have nothing better to do than spread their negativity across the internet and to those around them. This plan really does work. I’ve been on it for 6 months and have lost 57 pounds. I’m going for another 23 and I’ll then be at my goal weight. So to those who are idiots – know the material before you show your ignorance. Get a life… on some other planet. Um, McDonald’s??? M&Ms???? McDonald’s should not be a part of any sensible diet. There are much healthier snacks, as well, than the ones you mentioned. There are SO many empty calories in this diet. I could definitely see someone losing weight on this diet, but maybe in muscle. For one, if youre not overweight, shut your mouth and go away, and if you are, I can say this diet is working well for me. Personally, I cannot stand the smell or taste of fast food, so I modified that form my snack list and such. Instead I do home cooked things like that. For instance, the example state a mcmuffin, well I made my own variant from home. But you can vary all you like, just remember to keep the fatty foods to a minimum, and drink tons of water. I got sick of constantly drinking just water so I added crystal light to my water bottles. And it didnt cause a weight gain. So just remember moderate exercise, and keep on this diet its GREAT. I went on the 3 hour diet about 4 years ago. I Lost 30lb’s, 3 pants sizes and 7inches from my belly! Although I still had a lot more weight to loose I did’t stick to it and gaind it all back over time. Now I have a 5 month old baby and I am back to the same weight I was the first time i started.So im giving it another shot! This diet worked well for me the first time I just hope this time I can get past the 30lb point. Basically Jorge uses the Zone Diet and as a plus offers personal coaching and group support – for a price – on his website. Also people that is a example what is listed you have to buy the book.